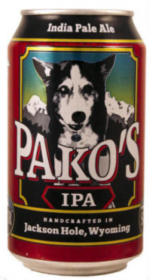 Pako’s IPA is an American beer, it has an alcohol content of 6.8%. Named for Pako (say “PACO”) the dog (No wait, Pako’s not a dog!) This full flavored, fully hop-evident IPA will have the hopheads rejoicing. 6.8% ABV and 60+ IBUs with explosive hop aroma from a pungent Simcoe/columbus blend.